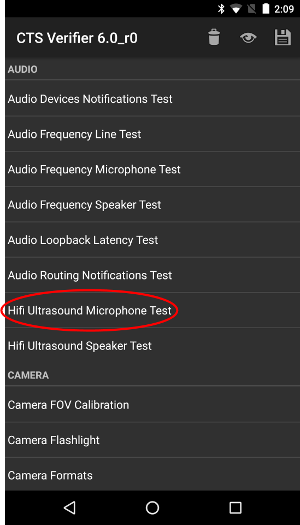 This document contains steps for conducting near ultrasound (formerly known as hifi ultrasound) microphone and speaker tests. 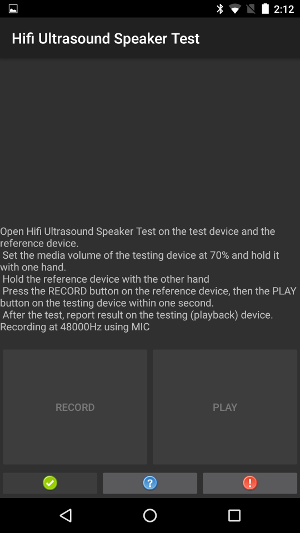 See the Audio section for general audio implementation instuctions. Prerequisites: Prepare two devices, one as the test device, one as the reference device. 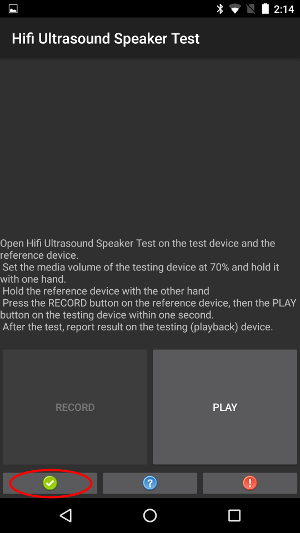 The reference can be Nexus 6, Nexus 5, or any device that is known to be able to produce near ultrasound sound. 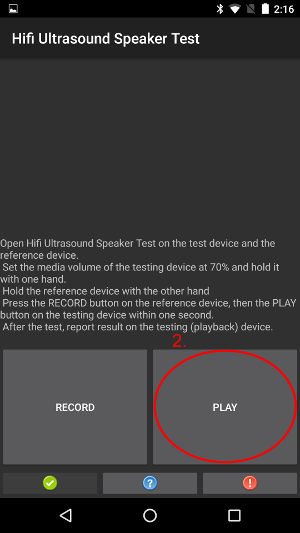 Step 2: After opening the test, press RECORD on the test device, then quickly press PLAY on the reference device. 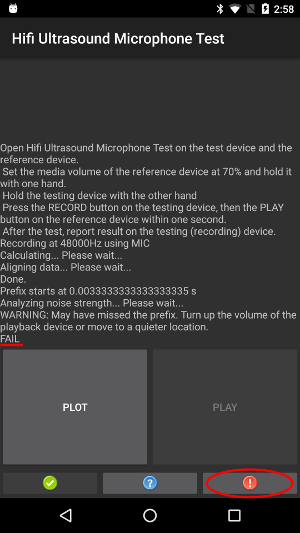 Step 3: Wait for the test to finish. 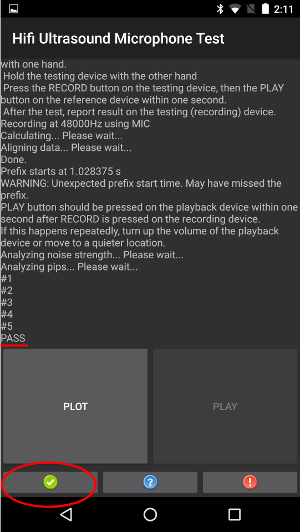 While waiting, the devices should look like the following screenshots. Do nothing until you see the screens shown in Step 4. 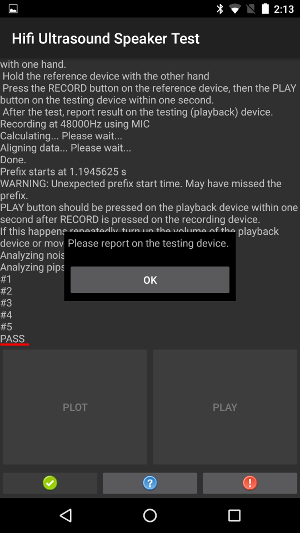 Step 4a: On the test device, if text PASS is shown, report passed by pressing the green button. Step 4b: On the test device, if text FAIL is shown, report failed by pressing the red button.Afterward you can repeat from step 1 to repeat the test if desired. Extra step: This step is not required.You can plot the calculated response using the PLOT button on the test device. 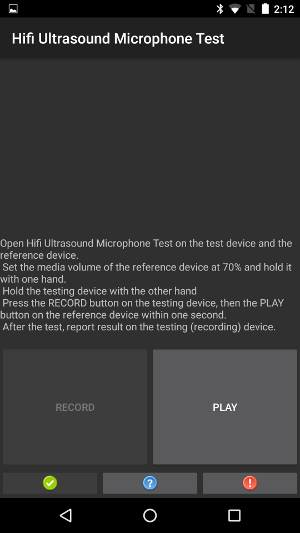 Step 0: Prepare two devices, one as the test device, one as the reference device. The reference can be Nexus 6, Nexus 5, or any device that is known to be able to record near ultrasound sound. Step 2: After opening the test, press RECORD on the reference device, then quickly press PLAY on the test device. Step 4: When you see the popup on the reference device, press OK on the test device. 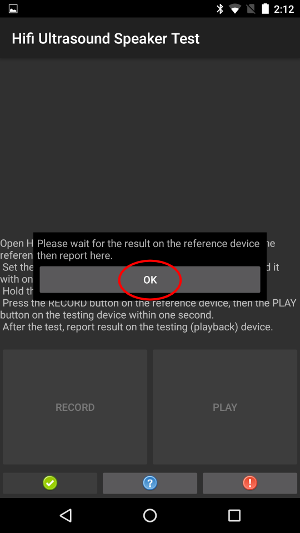 Step 5a: On the reference device, if text PASS is shown, report passed by pressing the green button on the test device. Step 5b: On the reference device, if text FAIL is shown, report failed by pressing the red button on the test device.Afterward you can repeat from step 1 to repeat the test if desired. 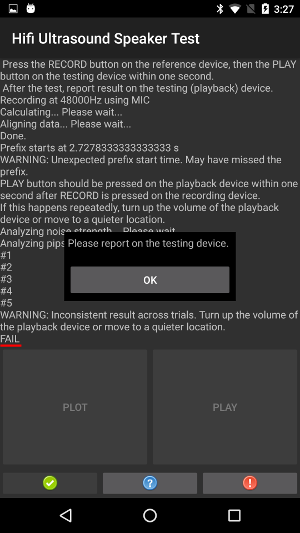 Extra step: This step is not required. 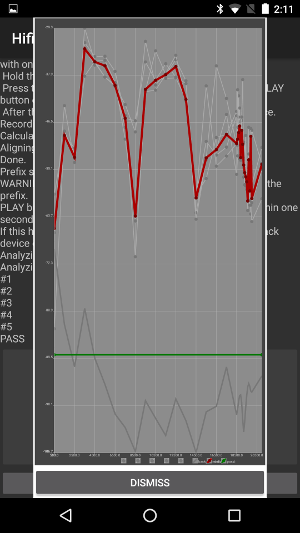 You can plot the calculated response using the PLOT button on the reference device. 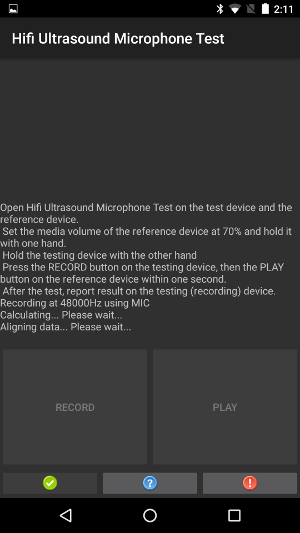 See the instructions on the Near Ultrasound Microphone Test.